Peregrine falcon, red-tailed hawk, great-horned owl, and the bald-headed turkey vulture are among the live birds of prey that Tom Ricardi brings to the Harwich Conservation Trust’s (HCT) signature summer event at the Harwich Community Center in July. To bring audiences close encounters with these majestic raptors, the HCT teams up with Ricardi who runs the Massachusetts Birds of Prey Rehabilitation Center in western Massachusetts. The event is sponsored by the Birdwatcher’s General Store, Cooperative Bank of Cape Cod, The Cape Cod Times, Cape Cod Chronicle, Cape Codder, Harwich Oracle, and The Register. Originally a state game warden that retired after 39 years, Ricardi now rehabilitates eagles, hawks and owls. After recovering from injuries, some are released back into the wild while others have injuries that prevent survival in the wild, but enable Ricardi to showcase their specialized traits. Ricardi holds state and federal permits that enable him to lead these one-of-a-kind educational presentations. HCT’s Ryan Mann actually worked with Ricardi at the raptor rehab facility in western Mass. Ricardi is often credited with being a driving force behind bald eagle restoration in the northeastern U.S. In the 1960s, the American bald eagle declined precipitously from years of DDT pesticide use that pushed the national symbol of strength and majesty onto the federal endangered species list. DDT residue traveled through the food chain and became concentrated in raptors at the top of the food chain like eagles, hawks, falcons and others. The bio-accumulation of poisonous pesticide interfered with raptor reproduction by causing thin eggshells, which actually cracked beneath nesting parents. In the 1960s, thanks to Rachel Carson’s book Silent Spring about pesticide impacts on wildlife, national action galvanized against DDT and the U.S. finally banned it in 1972. 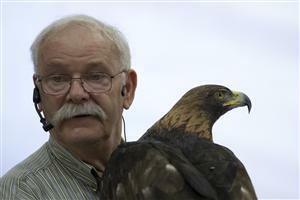 The long road to raptor recovery began with rehabilitation leaders like Tom Ricardi. In 1982, Massachusetts started its first eagle restoration effort, producing chicks by 1989. Since then, more than 67 bald eagles have fledged in western and central parts of the state, mostly around the Quabbin Reservoir and along the Connecticut River. Among the raptors, Ricardi either brings a bald eagle or golden eagle, each of which can have a wingspan of up to 7 ½ feet. He has a peregrine falcon, the fastest bird in the world that can be clocked at over 200 mph in steep dives after prey. 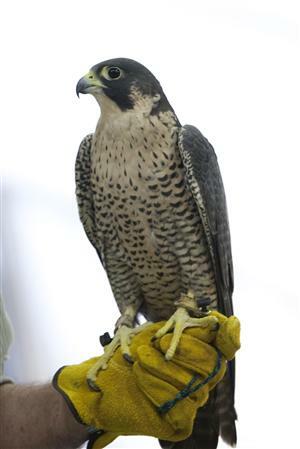 The peregrine is still used in falconry, which itself dates back more than 3,000 years with Asian nomads. 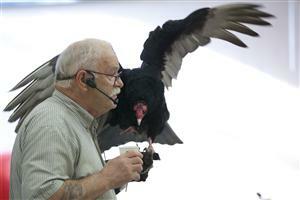 The turkey vulture is an annual guest as well. With its long wingspan, featherless head and keen sense of smell (very unusual across avian species), the turkey vulture can be seen riding the wind in slow circles above Cape Cod. Ricardi also brings an American kestrel, the smallest and probably most colorful raptor in North America. The red-tailed hawk, a distant sight soaring high above the Cape, also makes an appearance for an up-close view. And Ricardi brings a great-horned owl to show the physiological differences between hawks and owls. Usually you only see raptors at a distance, so this is a great opportunity for folks to see them up close. 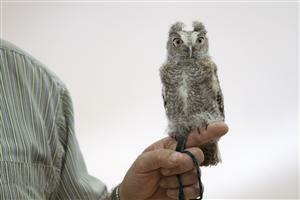 The event also helps HCT raise funds to preserve land, including important habitat for local birds of prey.